Oby's Blog: Ngozi Okonjo-Iweala shows off her famous multi timezone watch Wow! 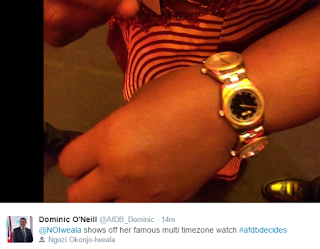 Ngozi Okonjo-Iweala shows off her famous multi timezone watch Wow! Never seen a watch like that ... lovely! A very busy woman needs to know what time it is all over the world.